Jay signed from Luton Town as an Under-13 and is an attacking left-back who is equally capable playing on the left wing, a position from which he scored in the FA Youth Cup final in 2014.He made his youth team debut as an Under-15 in 2012/13 before his breakthrough the following season in which he played 23 youth team games, including starts in both legs of the Youth Cup final and an Under-19 debut.Quick and strong, despite his slight build, Jay excelled in his first months as a scholar and quickly progressed to become an Under-21 regular. He played in every game of the triumphant Youth Cup campaign and all but one game as the Under-19s were crowned European champions.In 2015/16, Dasilva established himself as a vital part of the Under-21 starting team while also finding a goalscoring touch. He netted in the Youth Cup in ties against Huddersfield and Reading, while also scoring our only goal in the UEFA Youth League last-16 win against Valencia.The youngster tasted success in both competitions once again, lifting the Youth Cup for the third time and joining the record books along with teammate Jake Clarke-Salter. The duo join five of Manchester United's Busby Babes side in claiming the personal accomplishment.An England Under-19 international, he signed his first professional contract in July 2015. 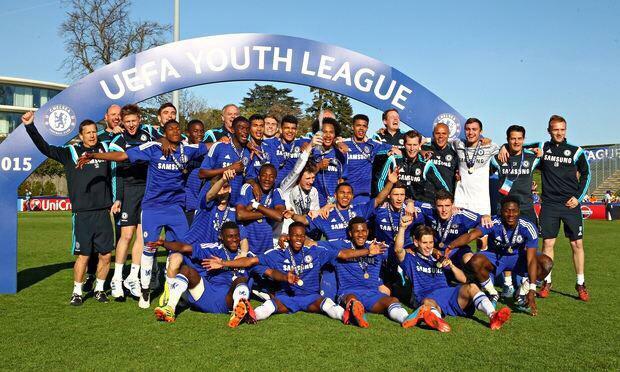 Congrats to Chelsea winning UEFA youth league. Jay da silva left back better player than any current prem left back. Damn, he should shave his "beard". He was very exciting, unfortunately his progress has stalled a bit. Same manager who was in charge of Dons when Bamford and Baker were there, who both did well. Some on twitter are saying he'll be playing left wing to replace Lookman who's getting linked with a lot of clubs. Was very impressive for our youth teams and U21s but my biggest concern was always about his diminutive size. I have seen him struggle against really powerful wingers. I wonder if this is to do with why he is struggling to get any game time for a struggling Charlton team in League 1. Some have labelled him as next Ashley Cole because of his style of play but I don't see him making it here long term because of his size unfortunately. He has a lot of talent but that is not enough. Really you would expect him to be getting into Charlton's team easily but has not worked out at all. Shame he's so small. If he was even Alba's size he'd probably make it here. He's marginally taller than Jordi Alba The greatest full back to ever grace our league was just 2 inches taller He's taller than Roberto Carlos was He's the same height as Lahm He's the same height as Dani Alves . He's 18 & playing against people twice his age in a league which values physical strength over technical ability (unlike the Premier League, where he should be playing), after being our best youth player despite being 2+ years younger than the rest. Ask him to build some more strength maybe, but he isn't diminutive A very quick Google/Forum/Twitter search reveals Charlton fans harp on about him not playing & are bewildered that he doesn't (and when he does, it's out of position in midfield apparently.) Let's not make up reasons for his lack of game time without even watching him. As is usually the case with feeder clubs, they'd much rather develop the talent which is their own, which will still be there next season, than gamble on someone they drafted in as back-up on loan. He isn't failing, the loan system is, again. But then again, he's only been there for about 7 weeks. Give an 18 year old being used as a substitute out of position, more than 7 weeks, come on. It's no coincidence our very best youth, Dasilva, Boga, Musonda, are now unheard of. They're flower-pickers who've been put into war zones. Or, military men put into gardening projects. It's nothing to do with them and everything to do with the environment the management choose to put them in. Put any of these players into Liverpool or Tottenham's teams and we'd be gagging for them. Questioning these players is questioning our own rationality. He's actually shorter. Alba is listed as 165cm and Jay's at 164cm (5ft4). Ashley is listed a full 6 inches higher than him. He isn't taller than Roberto Carlos (168cm) nor is he the same height as Alves or Lahm. I've seen the guy play live and he definitely isn't just two inches shorter than Ashley. Besides, there's a kid who's a league above him who's killing at LB at 16, that's the sort of level we want Jay at or near. Dasilva is not 5'4, 5'5, nor is he 5'6, he's a stonking 5'7. I'm finding only one source online saying Dasilva is 5'4 (makes sense that they wouldn't update such minor players even more minor stats for a few years), that source is WhoScored. I can find you 10 sources right now, I have 5 open, which all state 5'7, including Chelsea-affiliated websites & Fifa & others. And I can find you Youtube videos of him playing alongside shorter players, and other players billed at 5'7 who look him directly in the eyes. He's even 5'7 on Fifa 17 & Football Manager. He was literally only signed on loan because their player was injured, and that player is no longer needing filled in for. Thus he gets no game time. Nothing to do with anything else. He's actually shorter. Alba is listed as 165cm and Jay's at 164cm (5ft4). Ashley is listed a full 6 inches heigher than him. He isn't taller than Roberto Carlos (168cm) nor is he the same height as Alves or Lahm. I've seen the guy play live and he definitely isn't just two inches shorter than Ashley. Ryan Sessegnon. Check him out. That kid is crazy. Hope Chelsea are keeping tabs on him. He's definitely not 5'7. He doesn't look it IRL. You're wrong. Listed by Chelsea officially as 5'4 too. I have the 2016/2017 handbook. It still has him listed as 5'4. I have not noticed him get bigger. Maybe put on weight but still looks very diminutive imo. There are prob a range of reasons why he is hardly seeing action at Charlton but I am sure the physical/height side of it is a huge factor.